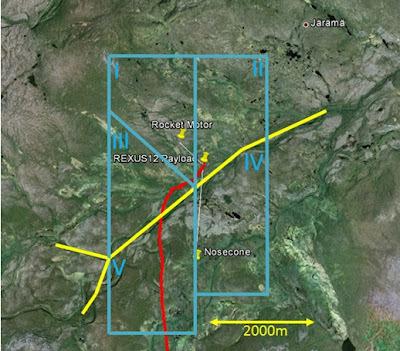 The Suaineadh experiment went missing after the REXUS12 rocket launch on the 19th of March 2012 from Esrange in Kiruna, Sweden. Due to the fact that the wireless connection between the experiment and the REXUS rocket worked for a few seconds, 22 images of the free flying experiment were collected. These images showed that the Suaineadh experiment was fully functional and working normally. Unfortunately, the last picture received is exactly at the beginning of the web deployment. Due to a malfunction of the radio beacon, the experiment with the recorded data could not be found from the recovery helicopter in March. The few received pictures of the fully functional experiment motivated the Suaineadh team to come back to Kiruna in summer to recover the experiment and bring it to a successful end. This time is now! Four adventurers will head to Kiruna tomorrow to search for Suaineadh for more than a week. The recovery crew consist of Thomas Sinn from Glasgow (UK), Fredrik Rogberg from Stockholm (Sweden), Michael Sinn and Jeremy Molina both from Stuttgart (Germany). The recovery mission will be carried out from the 17th till 26th of August. The first two days will be spent in Kiruna for the team to get prepared and to organise themselves. On Sunday, the team will travel to the landing zone of the REXUS12 payload to establish their Base Camp. The payload landing place lies 60km downrange from the Swedish space port ESRANGE. Nevertheless, the recovery team needs to travel 140km on paved road, 46km on gravel road and a 4-6km hike through the Swedish wilderness in order to get to the payload landing area. It is planned to establish a Base Camp at the payload landing zone and start daily expeditions into zones of interest over the following five days. The impact location of the nosecone (~1.5km to the south) and the rocket motor (~500m to the north) are known as well and it is assumed that the Suaineadh experiment is lying in between them. The satellite image of the search area indicates a slightly hilly profile without forest, mostly grass land and bushes. It is assumed that the experiment impacted the snow cover in March and would therefore lie on top of the ground now. The team is also bringing a metal detector in case the Suaineadh experiment lies under a cover of leaves or grass. Luckily, there are not a lot of lakes around the area, just one river to the south of the Base Camp. To reach into the zone IV and V on the 4th and 5th mission day, the river needs to be crossed by the recovery team. GPS and maps are used to navigate in the zones to cover as much area as possible. The entire recovery mission will be well documented by video and pictures which will be released as a documentary after the mission. The recovery team will return to Kiruna on Saturday, the 25th of August, hopefully with the experiment in their luggage. The outcome of the mission will be also presented at this year’s IAC in Naples (Italy) in October. Thank you very much to our supporters: the ESA Education Office for sponsoring our flights and the car in Kiruna and the experts of SSC and DLR for their help in preparing for the recovery mission.